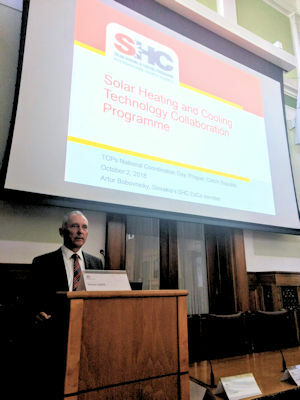 Artur Bobovnický, our ExCo member from Slovakia, shared why our work is important and the value of participating in the SHC TCP with the Czech audience at the IEA’s TCP National Co-ordination Day hosted by the Ministry of Industry and Trade of the Czech Republic and the Technology Platform “Sustainable Energy for the Czech Republic” (TPUE). It was a day focused on exploring opportunities of Czech participation in the SHC TCP and six other TCPs of interest. The event was held on October 2nd at the Ministry of Industry and Trade.